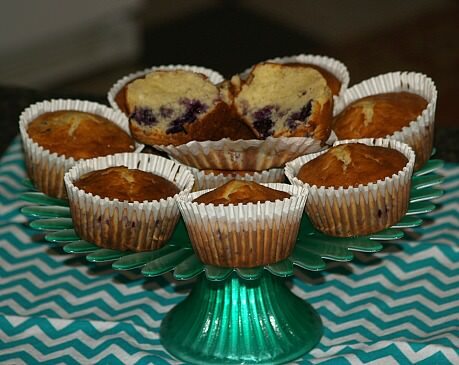 When I learned how to make blueberry muffin recipes I found all the following are delicious. Each recipe is a little different but I would hate to choose one recipe as the best and limit it to just one. The first is a cream cheese recipe. How can you beat that? Cream cheese makes everything more special. 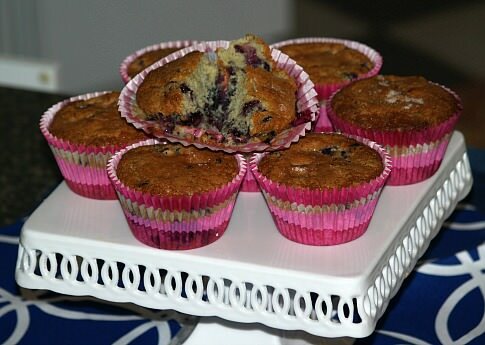 When I started to learn how to make blueberry muffin recipes in Florida, everyone brought the conversation around to the Jordan Marsh muffin recipe. Jordan Marsh was a very nice department store that used to be in Florida. It seemed everyone shopped at Jordan Marsh and everyone loved their recipe. I never found out how Jordan Marsh learned how to make blueberry muffin recipes. To this day, old customers still talk about this delicacy. It was different because it contained a lot of blueberries; some were mashed to flavor the batter and some were whole. When you bit into these muffins you got a mouthful of blueberries; this is why they were loved. I, for one, love the sour cream muffin recipe with blueberries, as I love anything with sour cream. To me the sour cream recipe adds a delicious taste and texture to the batter; then you have the taste of fresh whole blueberries. Unlike the way Jordan Marsh learned how to make blueberry muffin recipes, this batter is not flavored with blueberries, but I have to say this is one of my favorites. If you are wanting to learn how to make blueberry muffin recipes a little more on the healthy side, check out the low fat blueberry muffins or the oat bran muffin recipe. Lightly grease muffin pan or use paper liners. Toss blueberries with 2 tablespoons of the flour; set aside. Combine the remaining flour, sugar, baking powder and salt; set aside. With a blender, food processor or mixer blend the cream cheese, lemon juice, vanilla, milk and melted butter; add eggs one at a time and beat after each. Add the dry ingredients to the cheese mixture; stir to blend. Fill the prepared muffin pans 2/3 full. Bake 18 to 20 minutes or until muffins are brown and set. 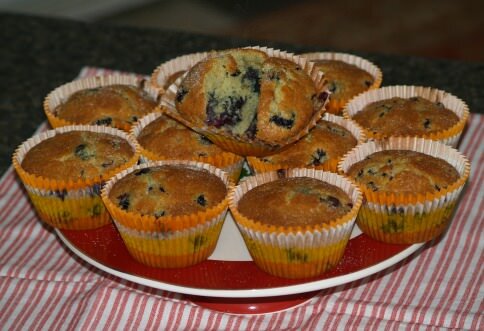 The next of the blueberry muffins is considered to be a healthy blueberry muffin recipe. The recipe has fat free milk, oats, egg beaters and canola oil but still has a great taste. Preheat oven at 400F degrees. Lightly grease or use paper liners. Place oatmeal in blender and blend for 1 minute. Combine oats, brown sugar, baking powder, and cinnamon. Add the milk, oil and egg beaters to the oat mixture; stir until moistened. Add blueberries and stir to blend in. Some say this last recipe is the ultimate blueberry muffin. It is the Jordan Marsh blueberry muffin recipe. I always loved shopping at the Jordan Marsh stores in Orlando. They were quite nice and it was such a shame to lose them. I have many memories of taking my children shopping there when they were young. I had heard so much in those days about the Jordan Marsh blueberry muffin. Try it and let me know what you think. Preheat oven to 375F degrees. Prepare large size muffin pan by lightly greasing or lining with paper liners. Cream butter and sugar until fluffy; add vanilla and add eggs one at a time beating after each addition. Sift the flour, salt and baking powder together; add alternately with the milk to the creamed mixture. Crush ½ cup of the blueberries with a pastry cutter and mix into the batter; fold in the remaining blueberries. Divide batter evenly in each of twelve cups; sprinkle cinnamon and sugar over each. Bake for 30 minutes or until pick comes out clean. Cool before removing from pan. Place quick cooking oats in the blender; cover and blend 1 minute. Combine blended oats, brown sugar, baking powder and cinnamon in a large bowl; add milk, oil and Egg Beaters. Stir until dry ingredients are moistened; blend in blueberries. Fill paper lined muffin tins about 2/3 full and bake about 20 minutes or until muffins test done. Combine and mix all dry ingredients (except topping) in one bowl. In another bowl mix oil and eggs; mix in milk and blueberries. Stir dry ingredients into the wet mixture only until moistened. Spoon ½ cup batter into each greased or paper lines muffin tin; bake 20 to 25 minutes. Remove from oven and brush with melted butter; sprinkle with cinnamon sugar mixture. Learn how to make pancake and waffle recipes; basic recipes can make many variations like banana, chocolate, blueberry, apple, orange, corn, spice and pecan. Make tasty chocolate chip cookie recipes like MM cookies, bars with mint, sugar free and cashew cookies with frosting.